Dehydrated Alfalfa Meal, Wheat Middlings, Dried Distillers Grains with Solubles, Soybean Meal, Soybean Hulls, Cane Molasses, Dicalcium Phosphate, Salt, Soybean Oil, Calcium Carbonate, Lignin Sulfonate, Yucca Schidigera Extract, Vitamin A Supplement, Vitamin D3 Supplement, Vitamin E Supplement, Riboflavin Supplement, d-Calcium Pantothenate, Niacin Supplement, Vitamin B-12 Supplement, Menadione Dimethylpyrimidinol Bisulfate Complex (Source of Vitamin K Activity), Choline Chloride, Folic Acid, d-Biotin, Zinc Sulfate, Ferrous Sulfate, Natural and Artificial Flavors Added,Manganese Sulfate, Copper Sulfate, Ethylenediamine Dihydriodide, Cobalt Sulfate, and Sodium Selenite. 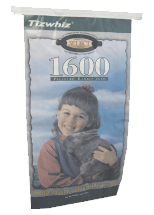 Tizwhiz Select Basic Blend 16% Rabbit Pellets are nutritionally complete, and no additional feeding of hay or grain is necessary. The following feeding recommendations are for rabbits of New Zealand size. Adjust size for other breeds. Gestation: First 2 weeks feed 3-4 oz per doe, once a day. Gradually increase feed to 6 oz during last 2 weeks before kindling. Normal gestation is 31 days. Young Rabbits: Self feed until proper weight and condition is maintained. Keep surroundings clean and free of parasites and dirt. 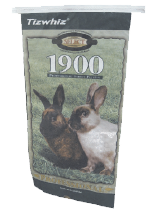 Tizwhiz Select Basic Blend 19% Rabbit Pellets are nutritionally complete, and no additional feeding of hay or grain is necessary. The following feeding recommendations are for rabbits of New Zealand size. Adjust size for other breeds. Young Rabbits and Breeding Stock: Self feed until proper weight and condition is maintained. Bucks: Feed 3-4 oz once a day, or enough to keep in good condition. Do not over feed.